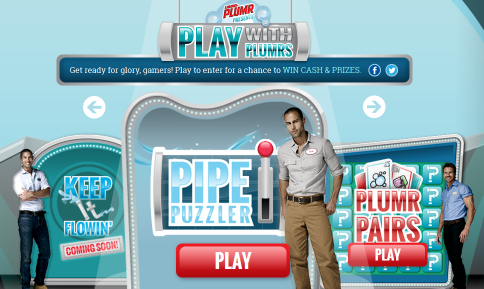 Liquid-Plumr® Plumr Pipe Puzzler Instant Win Game – Win a $25 gift card & more! Win a $25 pre-paid gift card and a coupon for a FREE Liquid Plumr product (231 winners)! ENTER SWEEPSTAKES HERE – Liquid-Plumr Sweepstakes page. ENTRY LIMIT – Limit: You may play the Pipe Puzzler game as many times per day as you would like but you will only receive one (1) play of the Instant Win game each twenty-four (24) hour period during the Promotion Period. ELIGIBILITY – Liquid-Plumr Pipe Puzzler Instant Win Game is open only to legal residents of the fifty (50) United States and the District of Columbia who are at least eighteen (18) years old at the time of entry. SWEEPSTAKES PERIOD – The Instant Win Game begins on January 15, 2015 at 12:01 p.m. Pacific Time (“PT”) and ends on April 1, 2015 at 12:00 p.m. PT. PRIZES – TWO HUNDRED THIRTY-ONE (231) GRAND PRIZES (three (3) prizes awarded each calendar day): $25 awarded as a $25 pre-paid gift cards (terms and conditions apply) and a free Liquid-Plumr product awarded as one (1) free product coupon (valued at up to $8.50, terms and conditions apply). Approximate Retail Value: $33.50.